Everybody’s home and garden are different and as such, we believe that people’s garden rooms should also be individual. Bespoke garden offices have become very popular among those who don’t want the stock alternative many others offer. One of our recent works took place in a conservation area for example. 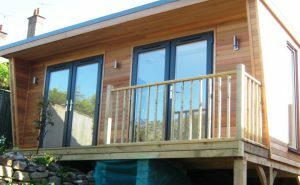 Extremely tight regulations meant that we had to consult the local planning authorities and design, piece together and create a customised garden room that crossed the ‘I’s and dotted the ‘t’s of the surrounding area. This is the sort of thing that we at Kent Garden Rooms excel at. Our years of working on numerous projects within the general construction sector have meant we’ve had to adhere to the most stringent planning regulations and adhere to the highest caliber of planning law. This particular garden room was built on an elevated site and so required a frame. We consulted with the buyer and decided on green oak stilts for the elevated frame. Over the last few months, we’ve also been conducting market research in a variety of areas and since then have been working on a number of new designs in the garden room space. 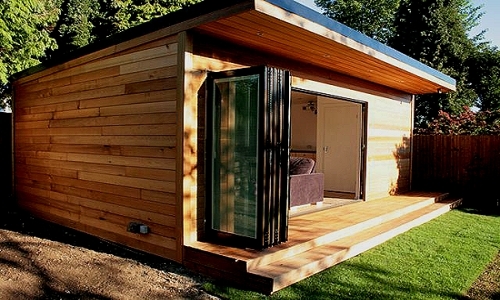 These designs, like all garden rooms, will meet the extremely high insulation and other standards all garden rooms do. This design of garden room is most notable for the inclusion of a valeted ceiling. As you can see it’s a very attractive room, which could be utilised for a wide variety of uses in the garden area. Alternatively, this garden room with apex roof is another we’ve been working on of late and we feel creates plenty of space and room and is the perfect fit for the garden area. This sort of spacious feel is one that we regard as optimal for garden rooms. However, there are bespoke fittings, what you require is up to you in that regard. Your garden room interior can be anything you want it to be. Like any room in the home garden room interiors can be a whole host or variety of things. The inside of a garden room is a home from home, an enjoyable warm place in the outdoors that offers a whole host of benefits. So, here are some tips on what you could do with it. We all love exercising outdoors, however why not have a gym in the garden with our garden rooms. The large glass doors are the perfect addition and allow you to look outside when working out inside. It means there is no excuse to not go out and about and do exercise as the reality is your indoors are now the perfect meeting point between the inside and outside. So, what’s stopping you from considering a gym in the garden? Executive garden rooms are the perfect place to work outside when inside and allow you a lot of the benefits of the natural world – something a lot of us don’t get when working in an office. Our open and beautifully designed garden rooms provide people with the best of both worlds when working from home and area peaceful, attractive proposition for those wanting to work from home but without many of the distractions. Get in contact with us to discuss our garden offices and our executive garden rooms. A garden music studio is also a great idea and can be a fantastic creative space. We are the experts in and provide bespoke garden music studio options that will make any aspiring musician delight. A garden music studio allows you to benefit from the fantastic outdoors and means that nature can be part and parcel of your creative process. It’s also the perfect space away from the home, meaning that you can let rip and not worry about putting anyone in the home out when you turn up the volume – testament enough for our garden music studios don’t you think? Outdoor studios allow such things to become a reality. A garden room can also just be a place for peace and people often enjoy using them as an outdoor study or reading room. It can be seen as a sanctuary garden room and a place to get away from the hustle and bustle of daily life. Rooms outdoors are a fantastic addition to the home, provide a lot of extra space and also don’t have nearly as many issues with planning permission as a lot of alternatives do. Understanding you can make a lot out of your garden room interiors and design them as you wish can be a big help.